Congratulations to Kris Allen, the newest American Idol and to Adam Lambert, the runner up. Their long road through the all the challenges of competition have ended and they are now on their way to bigger and better experiences. Can you believe all the “hoop-la” that has been posted in the last 24 hours? There are those who are happy, those who are mad, and those who think that American Idol needs a make-over. When checking Google for some sources, there were 4,885 articles under news of American Idol. Everyone has their opinion and wants to share it with the world. There seems to be many reasons for all these articles. The American Idol winner caused an anomaly. According to all the press, Kris was not supposed to win. Adam was the “anointed” winner. The number of people who watched the finale has declined by millions. It was the second lowest rated finale in eight years. American Idol is no longer a singing contest. The show is getting stale. Some of the opinions are legitimate, but the big question should be will American Idol do something to rescue their sinking ship. Even with the low numbers, American Idol is a “cash cow.” Each year, they make millions through advertising so should they rock the boat? Clay Aiken joined many journalists who put some of the blame for the low numbers on the judges who seemed to have an obvious bias as to who should win. They suggested that no one likes to be told how to vote. Some felt that the judges should critique each performer, but declaring a winner before the finale is not being fair. Some articles suggested that the audience is homophobic and some feel Kris won because he is a Christian. Is this a legitimate concern? Then there is the American Idol voting system which many think is a complete joke. Since you can text or phone in votes over and over again, is the vote fair? If the vote was switched to one vote per phone, would the outcome be radically different? All of these concerns are interesting and cause a great deal of discussion. One can only hope that American Idol will read some of the suggestions and try to get back to their original idea which was to find the best unknown singer in America. Your comments on American Idol and your suggestions for next year are welcomed. It would make an interesting discussion. On Wednesday night, Clay Aiken blogged about American Idol. He answered some questions about the finalists and gave some opinions about the show. We don’t usually copy Clay’s blog on this site as it is against our policy. However, since the blog has been published in edited form everywhere, the entire blog should be shown so readers know exactly what Clay said, not what the gossips want us to read. Now that it’s all over, and for the record…. I couldn’t be happier about the way AI ended this year. I only turn the show on once a season, and only to see what the set looks like each year. This year, I happened to turn it during the minute that Adam Lambert was singing “Ring of Fire” and, at that moment, thought my ears would bleed. Contrived, awful, and slightly frightening! I wasn’t really a fan and found myself surprised whenever folks told me that they liked him. Granted, I never saw another performance (and many folks who I trust said that he was great) but I can’t imagine I would have enjoyed it. Just not my cup of tea at all. To each his own. I never saw Kris sing on the show, but whether he was good or not is really relative. It’s usually a matter of taste, right? But Idol is not always a matter of musical taste only. It’s about the person you like. From what little I saw, Kris seemed likable. (That’s not to say that Adam isn’t just as likable as anyone.. maybe more so… I don’t know) When Ruben and I were standing next to each other every night (many years ago) you had two equally talented, equally unlikely, equally unpolished contestants…. so it really was a matter of taste as to who was voted for. While some may argue that one of us was hyped more than the other, I don’t feel that was the case. However, this year, there was an obvious bias. Not even having watched the show, I can tell you that I was WELL aware of the bias from the judges as to who should win. In my opinion, that is awfully unattractive. I don’t think I am alone. In my opinion, it all often comes down to that last night of voting. Until the finale, folks are voting for the contestant that they want to see continue. But, I believe that on that last night, the dynamic changes. No longer forced to choose one person that they want to see win, the audience can effectively vote AGAINST the person that they don’t want to see win. In the case of season two this might have happened. There may have been some folks who voted for myself or Ruben because they didn’t like the other of us. I was the nerdy little girly boy who some didn’t want to see win, so they may have voted for Ruben. I don’t know. .. But again, I feel that Ruben and I were fairly matched. We both had our detractors and negatives, but I feel we were both very worthy of being on that stage in that moment, and either of us would have been worthy of winning. The show was different then, and folks made it in seasons 1-3 because they were “real” people who happened to sing/entertain well. But, somewhere along the way, AI stopped being about real people and started being about “fame” and “gloss”; It stopped being about the talented kid-next-door and started being about who was most marketable. (I don’t think anyone would have argued in 2003 that Ruben or I were extremely marketable.) So, this year it was not like 2003. This year it all came down to two contestants so extremely different and mis-matched…. one that was so obviously the “favorite”… so hyped and polished and “ready for market”; who (accurately or inaccurately) came off to many as arrogant and superior … and one kid who no one thought had a chance and (accurately or inaccurately) came off as humble and real. In a battle between David and Goliath, my money is on David! I think many voters got sick of being “told who to vote for”. I think many were turned off by the blatant favoritism shown towards one contestant. Therefore, on that last night, they used their votes against a contestant that they were tired of hearing about and for the contestant who had been written off. And, at the same time, I think they voted AGAINST an American Idol that has, for four years now, been more about the slick productions and polished contestants than it has been about finding the raw talent that it did in its first three seasons. Those votes for Kris were also votes to return the show to its roots of finding “real” contestants with undiscovered talent and giving them the chance to grow and shine. They were votes that said “we’re tired of seeing contestants who already seem to know it all”. Will American Idol choose to listen to the resounding and clarion call that those voters gave them?…. “Enough with the pretention. More Rubens, more Clays, more Fantasias and Tamyras and Kellys please.” My faith has always been in the voters. I think they have gotten it right every year (mine included). It’s now up to American Idol to decide if it will finally REALLY listen to the folks that keep it on the air. Many of Clay’s fans discussed his comments all day. Some of his fans agreed with his entire blog while others were surprised that he was not a fan of their favorite contestant. It was a lively discussion. The most disturbing act of the day was when one of Clay’s constant detractors copied his blog and sent it to many gossip sites. It has now been picked up by almost every entertainment and music blog around. Perhaps this shows that Clay is a popular celebrity that draws readers to the articles. Will it affect his career or life? Hardly!! It’s a big deal today and a blip in the big scheme of things. In the meantime, Clay is out of the country, enjoying a short vacation. It amazes me how much press the man gets for a blog – goes to show that he’s still a very viable artist!!! You go with your bad self Clay!!! I’m glad AI is over for another year, at least. It has become the overused cliche for everything. It has to be slicker, gaudier, more dominating than anything else. Clay Aiken was correct in saying it has lost its original purpose. I love Clay for speaking his mind! I agree with everything he stated in his blog. You had to be living under a rock to not see the pimping of Adam Lambert this year! It was shameful and so unfair to the other contestants! Congrats to Kris for winning! He is very talented and deserved to win. Clay Aiken’s blog hit the nail on the head about AI. Unfortunately, the “reader challenged” among us picked one thing he said on a lengthy blog and parsed it. He didn’t say he didn’t like Adam or his voice, he did say he didn’t care for the version of ROF. As much as Clay Aiken has been bashed and criticized, he should be allow an opinion on his own private mb about AI or a contestant on that show. Actually, seems more people agree with him. Clay Aiken blogged the truth. People not reading the whole blog or taking snips out of context are just missing the boat. You go Clay! Clay Aiken negated the twitter story that he had asked to be on idol with Adam. He seems to be enjoying the sights of Paris with ???? this week. Clay Aiken Rocks!! And, according to Gene Simmons, Adam Lambert does not! I don’t see where Clay bashed Adam. I see that he said he didn’t like Ring of Fire, and based on that he probably wouldn’t like other songs. Lots of people in the past have based their opinions on singers, not just Clay, based on one song. If I hear a song from a voice I don’t like I’m not likely to listen to other songs from that person. People are really being unreasonable saying things about Clay when most of them do the same. As for Idol, the pimping was really out of hand. Adam was declared the winner at the beginning of the top 13 and was never criticized by anyone except for Simon’s criticism of Ring of Fire (same as Clay’s) and a couple other times for Adam being too theatrical. The is the second year they have allowed singers who already released a CD or have an entertainment background (like Adam’s 8 years in theater and in a traveling Broadway show). How is that fair to allow seasoned performers to compete against raw talent like Kris? Clay Aiken has an opinion just like millions of other Americans. And millions of Americans voted for Kris NOT Adam. Clay is certainly not alone in thinking that the overhyping of one contestant per season over all others has become tiresome, and never more so than this season. Wow! When Clay Aiken talks, everyone listens!!! Thank you for this blog. It is amazing that whatever Clay says is published ALL OVER the ‘net’. I guess people know he will get them some hits. Too bad they are not honest in their reporting. Wasn’t there an article here on Ethical journalism…….yep……….its happening again!! Clay Aiken had a backstage view of American Idol that none of us has ever seen. I would pay attention to what he has to say. I disagree. I’ve always thought that American Idol was for EVERYONE. I thought that was the entire point. People from all different places can come in & compete together. Where did it say that only “no name” people, maybe who have never performed publicly, should be the only ones competing? I think the whole concept of everyone being thrown in together is the entire draw of the show. I wanted Adam Lambert to win American Idol. Not because he was the “best” to ever be on the show, or because he was “shocking” but because he was interesting to watch. He was fun to watch. Never have I seen another contestant command the stage and USE the stage that way. With every aspect. He thought about what he could do with each song, what he could wear with each song, how he could ACT with each song. And that I love. I love being entertained and he is THOROUGHLY entertaining. I’m not horribly upset that Kris won, I just liked Adam better. Kris is adorable and so sweet and I’ll probably buy some of his songs, it’s just that he’s nothing new. And I don’t think that just because he’s the “boy next door” that can sing he should be entitled to the American Idol title. To me, it has nothing to do with it. I think American Idol has always been about gloss and fame. And the show has been on for what, like 8 years? It’s BOUND to change, to become more “modern.” It’s just inevitable. All that being said I feel that I have to state that I’m not sure I’ll buy an album from either contestant. I’m EXTREMELY picky and I think it will be hard for them to cut records that translate as well as their live performances. Speaking mainly of Adam there, naturally. Kris Allen may be like Jason Mraz, John Mayer, etc. but that means we already have him in spades & I’m already a huge Jason Mraz. But who is like Adam Lambert? Where can I get a couple of him? He’s a complete EXPERIENCE and that’s why I voted for him. Love that you don’t take sides….you don’t make Clay into anything he is not. That is refreshing. I agree that AI needs to do something. It is getting tired! First, I agree with Clay’s blog about the bias shown this season. I don’t even watch the show and I was fully aware of Adam being declared the winner long before the participants of the finale were even determined. Never heard of Kris at all. Seems a little lopsided to me. Adam was great, that it is all a matter of taste. Over the years he has been so diplomatic in his answers, sometimes I have felt to his detriment, that I was glad to see him tell it like he felt. Everyone has opinions, even Clay Aiken. Well I for one agree with Clay Aiken about AI! Week after week the judges were telling us that AL was our favorite….only thing…he wasn’t mine!!! If they want to pick the winner then they shouldn’t let America vote! Clay Aiken wrote his opinion of AI in a blog on his fan club site. To the surprise of many, anything he does or says is a media magnet. Once againm, this is no different. Thank you for an excellent blog about all the hoopla. Have a great weekend! It does make you laugh that anything Clay Aiken says, does, or doesn’t do, is picked up all over the world. The other really funny thing is the crazy person who stole the blog. Doesn’t the fool realize that he just helped Clay steal the spotlight from BOTH contestants??? As for AI? I think it has passed it’s sale date. It will continue to make money as entertainment, but I don’t think it’s a viable talent search anymore. Isn’t it amazing how Clay saying he was glad Kris Allen won was twisted and spun into reporting Clay said he was glad Adam lost. So many have proved they don’t comprehend what they read. Your blog covered it all so except to say I agree with Clay Aiken, there’s nothing more for me to say. Clay only stated his opinion. He certainly proved to have more balls than some of the less and/or more successful idols that probably think the same but are too afraid to say it.I totally understand Clay because I didn’t watch AI this year but saw lots of Adam on entertainment tv shows and on the internet. It was also a turn off for me and from what little bit of singing I heard, was not my cup of tea…BUT, BUT, an opinion can always be changed. 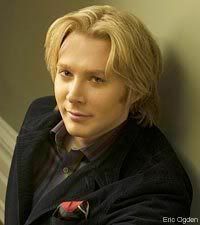 Thank you for the Clay Aiken blog! I certainly agree that AI has strayed from its original purpose of finding fresh new talent. fan board. I think it is telling that whenever Clay says or does anything-it is picked up by all the news media. I hope he is having a lovely time on this vacation. He deserves to. Clay Aiken is right on with his blog. When I watched the final 3 show, I was actually uncomfortable watching and listening to the judges gush about Adam. That’s not saying Adam isn’t talented – he is – but hey – there were 2 other guys up there too. It made me reach for the phone – and vote against a contestant, more than vote for a contestant. I totally agree with Clay about how Idol has changed since he’s been on, in the show competing for the title. I think that now it’s more of a popularity contest than the singing contest, that it’s susposed to be. Thank you for the blog, and am glad it is posted…word for word…. I do wish that people would read what he is saying…instead of making up what they they he said…. I have more respect for this man, than any other entertainer out there…. He has had his share of critics..who have bashed him completely…for no reason, other than they have an adjenda, and don’t like his music…but hey..that’s ok… NOT!!!!!!!!!! It’s about time Clay spoke up, and I am so proud of him for it…. I so agree with Clay. American Idol used to be about the kids next door living their dreams. Now it looks like they pull them from a stage to compete. I am so for it getting back to the basic concept. AI lost it’s innocence and fun for me 4 years ago. I really enjoyed it up until then. The pimping has to stop, it needs to be a level playing field for all of the contestants. So, I guess I agree with Clay Aiken. Thank you for the blog. I agree with Clay Aiken. I am not surprised that Clay is not a fan of Adam’s performances. They are as different as night and day! As far as American Idol goes, he was spot on in his assessment IMO! Well, music is subjective. I can see why many feel Adam was more talented, but I think it is also very true that he really wasn’t a lot of people’s cup of tea. I think a lot of people just really preferred Kris’ style over Adam. If more people thought Adam should of won than Kris, then they should of voted more for Adam. Sometimes I think it would be more fair if they limited the number of votes per person, but then they couldn’t report those huge number of votes. I am apalled and disappointed at the comments made by “Mr. Akin.” Adam proved to be an all-around music ARTIST, and chose to express his talents in delivering his interpretations via creative arrangements. Not ALL may have liked his versions, however he WAS the best in taking a risk and delivering it with expert showmanship (qualities Mr. Akin has ALWAYS grossly lacked) — but, do not take MY word for it. Let’s see who has the better $$ in sales/income when Adam’s first 5 years can be compared to that of “Mr. Akin’s.” Now that is a bet, I am certain Las Vegas High Rollers wouldn’t even be foolish enough to touch!! LOL! Chill. It is only an opinion. Not the end of the world and certainly just a blip on Adam’s radar. I sincerely doubt Adam is troubled by Clay’s opinion. No need to fly off the handle on his behalf. You might want to read the new blog by Clay. WOW…Anonymous, ‘professional suicide’ I’m awfully glad you are referring to Mr. Akin and not Mr. Aiken. Yeah, I think Mr. Anon should learn how to spell. I don’t know who this Mr. Akin is. Anywho…I completely agree with Clay Aiken on his blog. What a farce AI is. Its getting so old and especially the laughable judges. Geesh, with all the money Simon Cowell makes..you’d think he could afford something more than a t-shirt to wear. I do believe Adam losing was due to bigotry of the fact of rumor of Adam being gay. I follow many Christian organizations on many social sites and websites and I have heard this bigotry from them, which makes me sad. Idol is a singing contest, not a moral contest. And I have always believed that the audience doesn’t have one iota of choosing talent, but chooses people they favor. This is why I haven’t watched many seasons of Idol. Only 3, to be factual. I loved both Clay and Rueben and I couldn’t choose between them. However, Adam was the one to win for talent. Kris was as boring as the average singer in the shower. Plus, what I hate about the public voting is that of the multiple votes from one viewer counting and this is what helped Kris win. I only voted for Adam once because I thought that was the rules and legitimate thing to do. love ya Clay. I have no doubt that there was a religious faction that worked to vote against Adam. I am not convinced though that they were solely responsible for his loss though. Personally, I believe that the truth is that many people just happened to prefer Kris over Adam. I think Clay was correct. AI is just as much a personality contest as it is for talent. People vote for who they like. And I think that is as it should be because in the real world, an artist has to appeal to their audience on several different levels… not strictly on vocal ability. I agree about the multiple voting. I would like to see the number of votes restricted like it is on “Dancing With The Stars”. Error: Error validating access token: Session has expired on Tuesday, 21-Aug-18 16:13:01 PDT. The current time is Monday, 22-Apr-19 07:18:54 PDT.